On Wednesday, Sens. Tom Udall (D-NM) and Jeff Merkley (D-OR) introduced the Senate’s companion to H.R. 1, the For the People Act, ambitious legislation designed to increase the security and integrity of American elections. If passed, some provisions of this bill could represent meaningful steps to address the fact that the voting rights of the disability community are alarmingly truncated. Although 25 percent of the U.S. population is disabled, voter turnout in the disability community lags nearly 6 percentage points behind that of nondisabled people. A combination of factors contribute to this problem, including challenges with voter ID laws; inaccessible polling places; difficulty finding accessible election materials; and poll workers who are not trained to engage with disabled people. There’s a lot to celebrate in the new election reform legislation in terms of expanding and affirming access to the polls. But some areas could be improved to even more affirmatively defend voting rights for all. Good news for the disability community is that the legislation includes requirements for increased accessibility at polling places backed by grants to help pay for it; accessible registration materials; and accessible notices regarding voter roll purges. The proposal also includes mandates for more poll worker training and staffing to reduce lines and difficulties such as problems with accessible voting machines and limited staff to answer questions at the polls. The bill will expand access to early voting and same-day voter registration as well, which can be highly beneficial for voters who have inflexible schedules because they rely on personal care attendants, paratransit, and other factors that are out of their control to get around. These provisions’ benefits stretch beyond disabled voters; improving access also helps nondisabled parents of young children, low-income nondisabled people, and many other nondisabled groups of voters who have trouble making it to the polls on Election Day. Excitingly, the legislation draws upon a large pool of participating agencies to automatically register voters. Instead of relying on state departments of motor vehicles data, it also pulls from sources such as education and health care agencies. This ensures that people who do not drive or have state IDs can still benefit from automatic voter registration. In 2012, 7.5 percent of disabled people didn’t have valid state IDs, in contrast with less than 5 percent of nondisabled people. Yet there is considerable room to build on the already inclusive provisions of the bill. For example, accessibility mandates should be paired with clear mechanisms of enforcement. 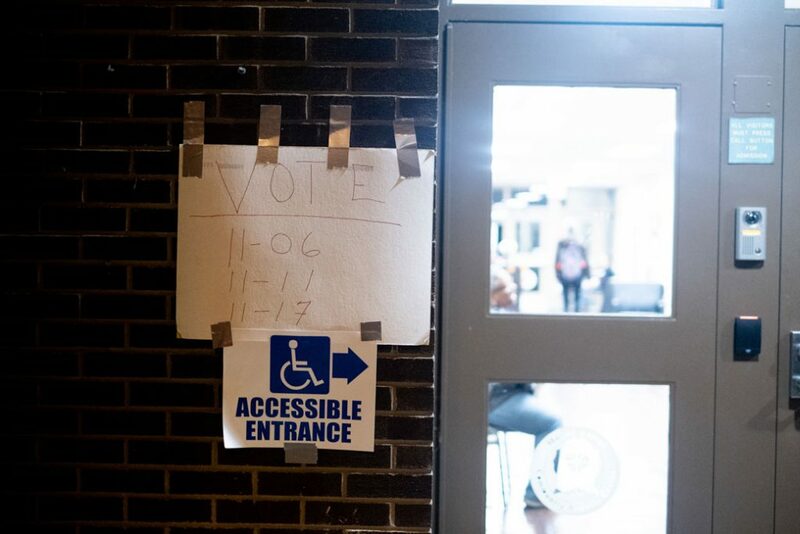 The U.S. Government Accountability Office’s latest report on voting access, published in 2017, indicated that 60 percent of the polling places surveyed had potential impediments for disabled voters—an issue that has remained constant over the past three election cycles. There are a variety of creative ways to approach the issue of physical inaccessibility beyond the new legislation, including supporting H.R. 865, the Rebuild America’s Schools Act of 2019. This act includes provisions to improve voting access at schools, which serve as common polling places. Furthermore, despite a mandate in the Help America Vote Act of 2002 that requires all polling places to have at least one accessible voting machine, many are not serviced regularly—and workers do not necessarily know how to use them. Mandating that all voting machines and equipment include universal design modifications could normalize accessibility and ensure that everyone can vote on any piece of available equipment. Importantly, poll worker training must include proper handling of such voting equipment. Furthermore, all poll workers—not just those covered by existing state and local laws—should be educated on how to respectfully interact with disabled voters. State protection and advocacy groups could assist with this, expanding upon their existing training services to increase access to the polls. To this end, extending federal funding for the Native American Disability Law Center is especially critical for addressing shortcomings in Indigenous communities. This issue is identified in the For the People Act and was also evident in the 2018 election cycle, when politicians in several states attempted to use the Americans with Disabilities Act (ADA) in their voter suppression efforts, targeting inaccessible polling places in black and Indigenous communities for closure. Pursuit of access violations was not equal across all polls—and these were long-established, well-known issues that officials had ample opportunity to correct between election cycles, including via federal accessibility grants. Some election security advocates are pushing to transition to a paper balloting system for the purpose of transparency and election security, and lawmakers have listened: Paper ballots provide a valuable audit trail that can increase election security. But the paper ballot mandate that has become a cornerstone of the For the People Act is also of concern to the disability community, which fears potential access issues that should be addressed from the outset to ensure that secure elections are accessible to all. The use of paper ballots poses challenges for people who lack the hand dexterity needed to manipulate and mark their ballots as well as blind and low-vision voters. One solution to this is a ballot-marking device (BMD), a technology that physically marks ballots for voters who cannot do so themselves. This technology is included in the legislation, which includes provisions stating that voter-verified paper ballots—whether marked by hand or with a BMD—must be compatible with accessibility tools such as optical character recognition devices. This provision suggests that lawmakers are thinking about this issue. Voters may also require assistance setting up and using the device, however, which compromises their ability to vote in private. The paper balloting mandate could also be self-limiting, closing the door to future options for providing secure, accessible voting mechanisms that would violate the paper ballot mandate as written. Importantly, in 2018, the U.S. Elections Assistance Commission declared that security improvements in election infrastructure cannot impede voting accessibility. Expanding the discussion to promote the development of simultaneously secure and accessible voting technologies could be beneficial for everyone concerned about election security, including elected officials, voters, poll workers, and communities. While the above recommendations focus on the federal level, there is also action that states could be taking on behalf of disabled voters. One of the most significant areas of concern is disenfranchisement on the basis of disability: 39 states and Washington, D.C., allow judges to bar those with state-determined “mental disorders” from voting. This means that an unreported total number of otherwise eligible voters are currently barred from the polls because of mental health conditions or intellectual, developmental, and cognitive disabilities. According to the Spectrum Institute, the restriction has affected at least 32,000 individuals in California over the past decade. Because the process of disenfranchisement varies by state, however, there is hope that states could follow the model used by Maryland and Nevada. Their model, which was based on guidance proposed by the American Bar Association, states that a person is only to be found ineligible to vote if there is “clear and convincing evidence that the person lacks the mental capacity to vote because he or she cannot communicate, with or without accommodations, a specific desire to participate in the voting process and includes the finding in a court order.” This makes it significantly more difficult to disenfranchise people on the basis of disability status. Strong lines of communication between the disability community and key agencies also drive voter turnout. Colorado, for example, engages in a county-by-county audit following each election to review accessibility standards; starting with the 2016 election, the Colorado secretary of state’s office began working closely with the state’s protection and advocacy agency to choose the new accessible voting machines to roll out in each county. In Nebraska, meanwhile, a close working relationship between the State Independent Living Council and the secretary of state’s office is cited as the reason the state has a 70 percent voter participation rate. Taking steps to affirmatively defend democracy and proactively improve access to the polls can and must include everyone—not least of all because it is the law. Legislation such as the ADA applies both inside and outside the polling booth. Equal inclusion requires that people be able to vote independently and confidentially via secure means—and ensures that everyone with a stake in America’s future is able to participate in shaping it. There is hope that better inclusion in the democratic process on the front end will pay off in the long term, as politicians listen more to their disabled constituencies and take action. s.e. smith is the deputy editor of TalkPoverty at the Center for American Progress. Rebecca Cokley is the director of the Disability Justice Initiative at the Center.